Your Chiropractor in Southampton and Newtown, PA! We are celebrating 30 years of service to the community, with two offices in Southampton and Newtown PA! Dr. Wendy Attadgie and the Licensed Massage Therapists at Attadgie Chiropractic Wellness Center are dedicated to helping you achieve your wellness objectives. Through incorporating Chiropractic Adjustments, Therapeutic Massage, Cold Laser Therapy, Nutrition and Exercise counseling, the wellness center team combines their genuine care, skill and expertise to help patients live a healthy lifestyle without pain and stress. 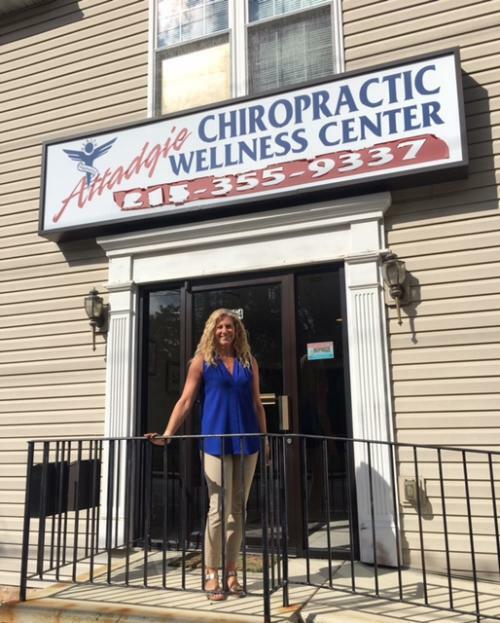 Patients seeking chiropractic care at Attadgie Chiropractic Wellness Center in either the Southampton or Newtown with Dr. Wendy Attadgie are assured of receiving only the finest quality care. She develops personalized treatment programs utilizing her incredible hands on chiropractic adjustments as well as instrument-assisted activator adjustments as a gentler option. She provides individualized care to patients of all ages and stages, from newborns, to adolescents, young adults, pregnant women, athletes, older adults, and seniors. The Licensed Massage Therapists working at both the Southampton and Newtown offices utilize deep tissue, Swedish, hot stone and other massage techniques to further help reduce your pain and stress and enhance your health and well being. Cold Laser Therapy is a recent addition to the practice which further helps to speed up healing and reduce pain and inflammation naturally. If you are new to our website, please feel free to discover and learn about chiropractic and our approach to your wellness. If you are interested in starting your journey towards wellness please subscribe to our award winning newsletter. If you are already a newsletter subscriber, please explore the member wellness section of our website for wellness articles, resources, and health facts---specifically targeted by Dr. Wendy Attadgie to your wellness needs and interests. ""I came to Dr. Wendy after two separate people recommended her to me. She has been so wonderful and is genuinely caring. The office is clean and cheerful, and Linda at the front desk is always professional and extremely friendly. I believe that what I have to pay is well worth every penny!"" ""I was referred to Dr. Wendy 2 years ago by a friend, and I would not go anywhere else. Dr. Wendy helped me when I was having a lot of low back pain, and I like that she is so personal. The office is very clean and everyone is so friendly. I have recommended at least 5 of my friends to Dr. Wendy, and would recommend her to anyone!""